I have a saying... If it's not Quattro buy a VW, which brought me to this test drive, the 2011 Audi S5 Coupe Quattro. At first glance the S5 seems tame, composed, elegant. But you will, upon closer inspection, notice the tell tale evidence of the raw power and muscle underneath that "Armani Suit". 19" alloys, 4 pipe exhaust and the low rideheight. LED daytime running lights adds the last touch to its commanding stance. A 4.2l V8 engine powers this beast, producing 260kw of power from a naturally aspirated intake. You would expect an engine of this size to produce a little more than 260kw, but this is made up by its ridiculous 440nm of torque! Talk about tearing it up!!! 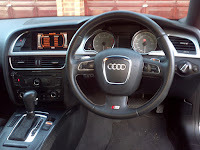 The route was Gateway Umlhanga to Reservoir Hills, this gave me a great opportunity to test out the different driving modes of the S5. When I jumped in the car I instantly sank into the sports bucket seats, securing me in place. The interior is not "loud", it has buttons and gadgets for everything, but you won't get lost in it. Everything was well thought out when designing the layout of the interior, taking into consideration the convenience to the driver. Now being a 4.2 litre V8, you don't buy this car for it's fuel economy. In fact when budgeting your installments factor in how much you are going to drive the car and how much fuel it's going to cost you. Otherwise you will be taking out the fun factor from the driving experience. Taking the S5 out of the parking bay felt like taking the Enterprise out of space dock. PDCs all round, with it's radar like beeps, made this task easy yet thrilling. 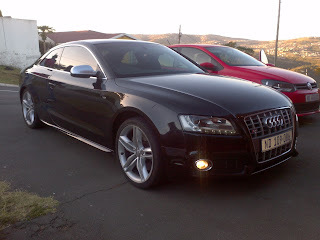 On the N2 highway, I took it easy, even then the fuel consumption was 16l/100kms, but it was great knowing that you can effortlessly over take at will, and it's commanding appearance virtually cleared traffic in front of you. I did a bit of a test and pushed the car a little faster and noticed that the fuel consumption dropped considerably, it was the S5's way of telling me "don't drive me slow". Then we got off the N2 and headed up the M19 highway, this is more of a steep hill climb with a lot of bends, making it the ideal place to test the S5's sport mode and, of course, Quattro. Once engaged, the car changed into something totally different, the steering got a bit tighter, the suspension got harder and the engine came to life. Going around the first bend, I really felt the difference Quattro made to the handling. I pushed it a bit harder on the next bend and it was like the S5 was defying the laws of physics. The car sat firm around every bend and had the ability to push even further. It was an experience like none other. After we got off the highway I dropped it back into normal driving mode and I instantly felt the car return to a more comfortable ride. The fact that you can choose how you want the car to perform and how much it changes from the different driving modes makes the S5 a perfect all rounder. Unfortunately if you want to own one of these bad boys you will have to settle for a used model. The S5 4.2l V8 engine was discontinued and replaced with smaller engines powered by turbos. Although the power and torque is more or less the same in current models you will have to do without that grunt that only a V8 can make. A quick search on the net and I picked up a few with decent low mileage and condition for around R500k. Great writeup, Just love to say that your article is excellent . It is informative too. I have found a good site for my Audi. Audi is continuously making its cars more versatile,stylish,luxury and according to the latest automotive changes. I have bookmarked this site and i will get back to you. Thanks for nice article . This was my most desired car when it came out. With the car suprisingly holding its value in Japan it's still out of reach. I too favor the V8 model over the new 3.0T. Agreed. This particular version is going to be a legend!